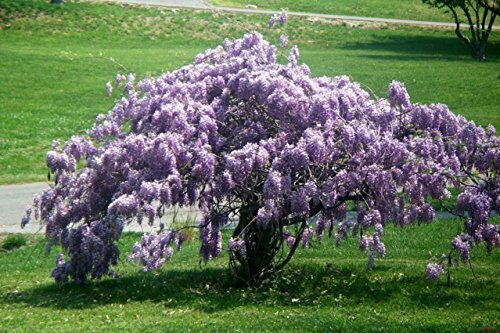 Wisteria is vigorous, twining vines with wide landscape usage where space permits and gardeners are committed to keeping them in bounds. Among their attributes are hardiness, vigor, longevity and the ability to climb high. They are greatly valued for their large, pendulous flower clusters that occur in the spring. Flowers are pea-like and may be white, pink, lilac-blue, bluish-purple or purple in color. Family of Wisteria floribunda 'Chinese Wisteria'. Plant in moderately fertile soil in full sun/partial shade. This plant has a fast growth rate. Hardiness zones 5-9. If left to vine some type of support will be necessary as mature plants can be quite heavy. Wisteria climb best on wires, trellises, arbors and pergolas. Blue Wisteria in a 2 1/2" pot just arrived and ready for immediate shipping as a 6 pack. All orders to California will be shipped bare root in accordance with their state regulations. In the spring this plant will produce large, pendulous flower clusters. Blue Wisteria can grow as a vine over trellis or fencing. With pruning can take on a tree form.